This Powerful, indoor horse training machine will enable trainers to control the speeds, duration and intensity of their horses while training on a stable, consistent and forgiving surface. Manage every physiological stressor in a training work-out, e.g. aerobic, anaerobic, and strength training. Accurate and repeatable collection of data to evaluate the efficiency of the training program. Facilitate regular stress testing to assess the timely development of athletic fitness. Scientifically summarize the inherited athletic makeup of young horses during their yearling year, before they are broke to ride; thus allowing for better business decisions regarding the individuals’ future. As a tool, the High Speed Treadmill has been scientifically proven to replicate the full range of motion of the horse in a controlled environment, therefore, making it a powerful modality when used during active rehabilitation of injuries. Veterinary diagnostics of the upper airways under full racing conditions will allow for more accurate recommendations for corrective procedures. Lameness exams can be viewed and filmed from any angle at any speed. 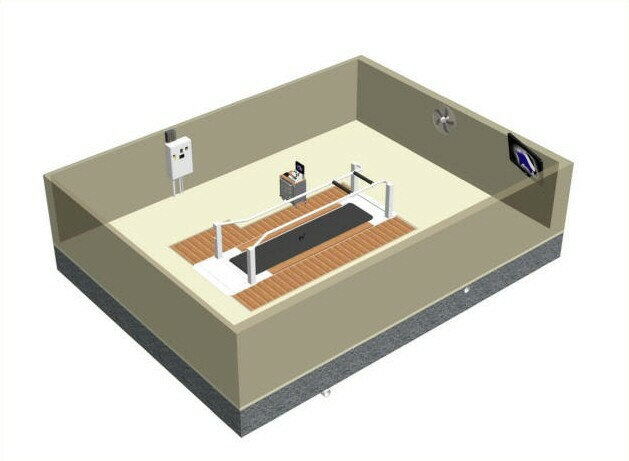 EquiGym can supply 3-D drawings which can include the exact room for the treadmill showing the treadmill in the pit and the surrounding areas, at no additional charge, (see example below). EquiGym is available for free consultation for any project.